Weather: You can go to NOAA’s Shiptracker (http://shiptracker.noaa.gov/) to see where the Rainier is and what weather conditions they are experiencing while I am back at school in Glenwood Springs, CO.
How do you become a hydrographer? After spending 2 ½ weeks aboard the Rainier as a Teacher at Sea, I found that this question had as many answers as the ship had hydrographers. In fact, if you take time to concatenate the data (obviously, I have become fond of my newest vocabulary word! ), you will learn that being a hydrographer is incredibly multi-faceted and is a confluence of ocean-, cartographic-, and computer-based sciences, with some outdoor skills thrown in for good measure. The Rainier’s CO, Commander Rick Brennan, finished college with a degree in Civil Engineering. In 1991, his senior year, he discovered NOAA when a professor suggested he check out the NOAA Corps during a recruiter’s visit to campus. 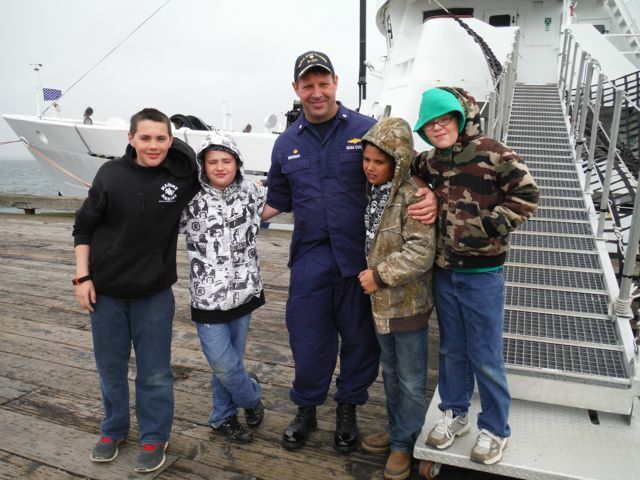 He started as a NOAA Corps member in 1992 and has been involved in hydrographic survey work ever since. His studies in the NOAA Corps training included coursework on ships, radar, and navigation, and led to his appointment as Commanding Officer (CO) of the NOAA Ship Rude (http://www.moc.noaa.gov/Decomm Ships/ru-index.html). This ship was NOAA’s smallest hydrography vessel at only 90’ long. Commander Brennan has seen many changes in hydrography during his career. First and foremost, has been its evolution as an academic discipline. The University of New Hampshire, based in Durham, NH, founded the Center for Coastal and Ocean Mapping in 1999. Their Joint Hydrographic Center was created through a partnership between the University and NOAA. (http://ccom.unh.edu/about-ccomjhc, http://www.eos.sr.unh.edu/) Prior to this, hydrography was part of more general courses in oceanography. Now, you can get a Master’s Degree in Hydrography. The last 20+ years have also seen significant changes in hydrographic technology, especially in the tools used to map the ocean floor. Prior to 1994, hydrographic vessels were outfitted with single beam sonar, instead of the multi-beam sonar that is today’s standard. 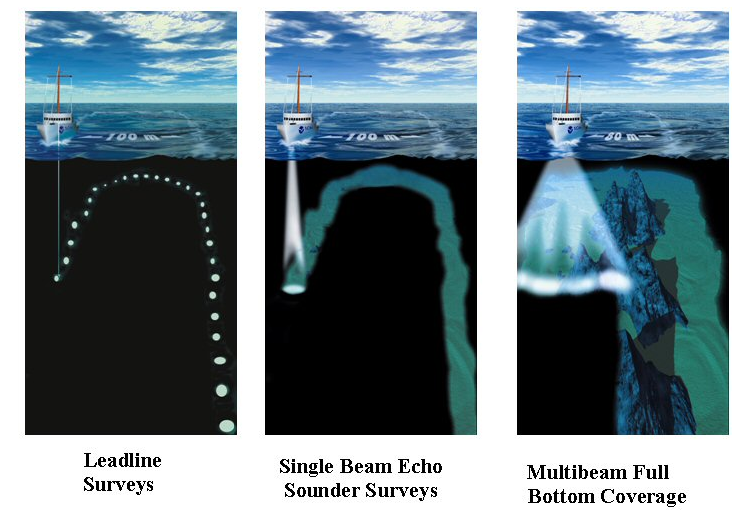 The single beam only provided bathymetric data at a single position on the seafloor directly below the vessel, while multi-beam sonar can give us high resolution information about the seafloor across a swath of the seafloor stretching several hundred meters to either side of the vessel. The Rainier, as NOAA’s premier hydrography vessel, was fully outfitted with multi-beam sonar by 1998. Other technological advances have included significant changes in information processing, from the days of paper tape and punch card programming, to the development of hydrography-specific data analysis programs such as CARIS. While data collection capabilities have changed exponentially over the past 20 years, CDR Brennan noted changes in how that data is used. NOAA has set the industry standard worldwide for collecting hydrographic data. Departments within NOAA are able to use that data to more than make charts. Fisheries biologists can use the detailed seafloor information in their assessments of ecosystem health and the availability of suitable prey species for all parts of the complex ocean-based food web. Shorelines are dynamic; charting plays a role in establishing baseline data in a changing world. Brennan foresees a future where navigators will view charts using a variety of platforms besides merely lines on paper; this will take educating mariners in how to utilize some of the new electronic tools that are available. Brennan reflected that, while there have been significant advances in the field of hydrography, there is still much work to do. NOAA publishes an annual review of its hydrographic survey goals (http://www.nauticalcharts.noaa.gov/hsd/NHSP.htm) . While this might not sound like the most scintillating of reads, it’s a fascinating look at the enormity of the concept of charting our coastline. Depending on how you view coastline—is it a smoothed-out line of the coast, does it include all the ins and outs and bays, or does it include all the United States’ navigable coastline extending out 200 nautical miles—one thing is certain, there’s a lot of it. In Alaska, alone, NOAA has identified 324,465 square nautical miles as Navigationally Significant. The identified total for all of the United States, including the Caribbean, is 511, 051 square nautical miles. Alaska is big! The crew of the Rainier will have plenty of work! Chief Survey Technician Jim Jacobson’s favorite area to survey is Southeast Alaska with its varied topography, underwater features, and interesting ports. He should know, since he’s been a member of the Rainier’s survey crew since 1990. Jim graduated from the University of Washington with a degree in Oceanography—at that time there were no hydrography-specific programs. When he began, a large part of the training consisted of good old, OJT—on the job training, learning new skills as new equipment and techniques became available. Needless to say, there have been more than a few changes over the past 20+ years. Jim began his career before GPS was a part of hydrographic survey. Setting benchmarks to establish sea levels was done using transits and theodolites, triangulating from known points on land to establish location and elevation on shore. Information was transmitted using microwave towers that were erected on site. Fast forward to 2013, where GPS is part of everyone’s vocabulary and the ability to know ‘exactly’ where you are is often in the palm of your hand. The Rainier’s tide gauge stations are set using GPS units that can identify location and elevation to within centimeters. He also began his career using single beam sonar, instead of today’s multi-beam. While single beam doesn’t have the pinpoint accuracy that multi-beam sonar might offer, there were a few advantages. It was a faster way to collect data, since you weren’t collecting as much information with each ‘ping’. Thus, you could complete more ‘sheets’ (an identified area for mapping) during your time at sea. Hydrographic survey techniques have changed over time. 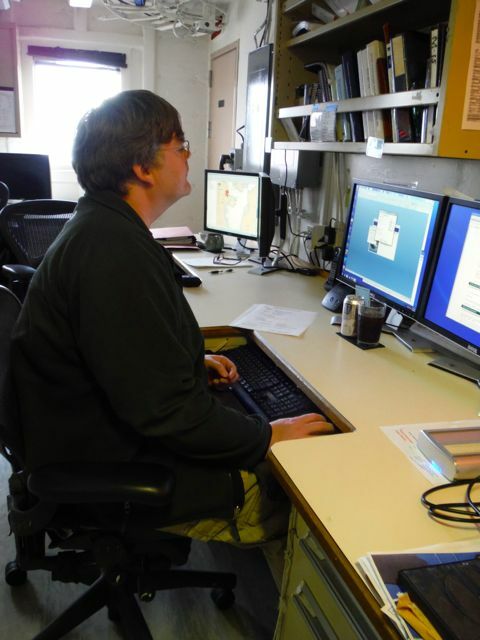 There have been incredible advances in data analysis since Jim started on the Rainier. Data collected each day has become more complex, requiring more hours of ‘cleaning’ to remove extraneous pings and information. Hydrographers use increasingly complex computer software to produce charts, often spending up to 5 hours to process one hour’s data. What’s next? Jim imagines a future with underwater mapping done by ROVs, remotely operated vehicles, cruising the seafloor to send back terabytes of information. ROVs are already used in a variety of information-gathering capacities, sending back high-quality video of seafloor conditions, information on water chemistry, or video of marine life from far below the surface. 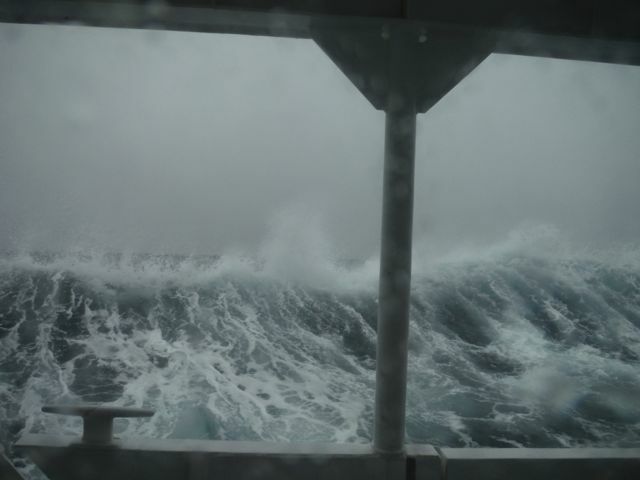 Here’s what hasn’t changed–hydrographers work in all sorts of weather and ocean conditions! Christi Reiser didn’t start out planning to be a hydrographer. She has, perhaps, the most diverse resume of any of the survey team. Christi is currently a college student, and will be receiving her BA in Geography from the University of Colorado, Denver at the end of this year. 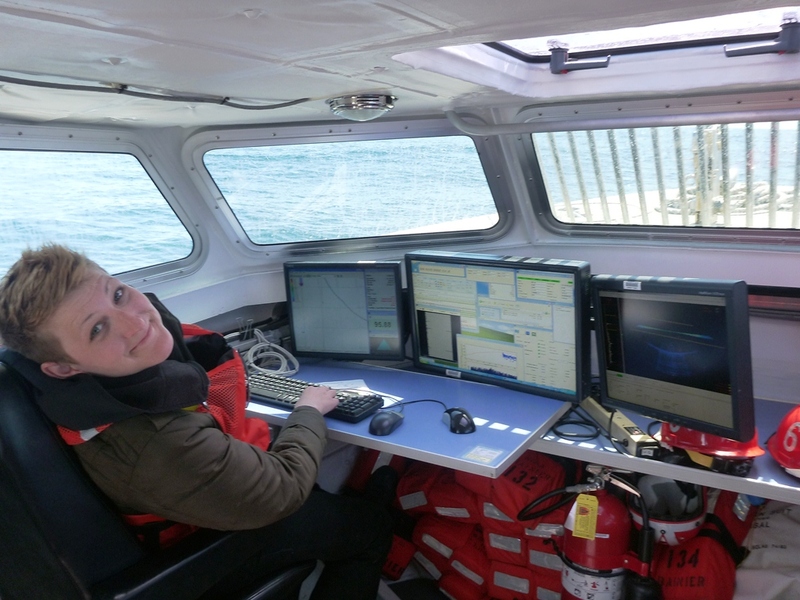 Her hydrography career began in May, 2012 when she was hired as an intern on the Rainier, earning college credit while working for NOAA. 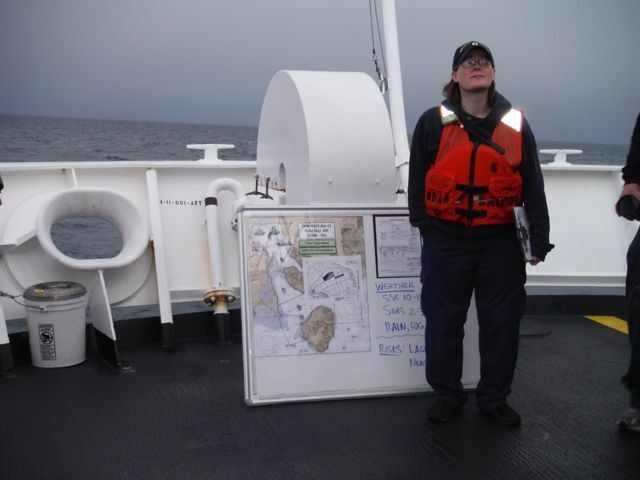 Through her internship Christi has found that NOAA is one of the most education-oriented organizations she has worked for, constantly providing opportunities to learn new skills and information. She is excited to be working in a GIS-based field and considers it to be one that is ‘never-ending’, since only 4% of the sea floor has been mapped! After graduation, her next step may be a Master’s Degree in Geography, to add more science research experience to her knowledge base. After that? Well, all I can say is that Christi plans to create a new job that “doesn’t even exist”. Stay tuned. So, the next time you’re talking to your guidance counselor about college plans, or wondering what you might want to be when and if you grow up, consider the field of hydrography. Where else do you get to wear a life jacket to work? Field Operations Officer (FOO)Meghan McGovern goes over the Plan of the Day. Where else do you get to wear a life jacket to work? Now that I’ve been home a few weeks, it’s time to reflect on my Teacher at Sea experience. I’ve been asked, more than once, “Did it meet my expectations”? That’s an easy question to answer—the answer is “No, it exceeded my expectations!” I came away from my time on the high seas with much more than just knowledge of the complexities of seafloor mapping. As a firm believer in the concept that ‘everything is interesting’, it would be hard to point to any aspect of my trip that wasn’t something fun and interesting to learn! The teamwork, efficiency, and camaraderie on the ship were a common thread uniting each day’s activities. Each crew member played a role in the success of the ship’s mapping mission. It took everyone from the engine room to the bridge to keep it all ‘shipshape’. There was really no job too small—everything and everyone had a necessary role. I especially appreciated the fact that every crew member was willing to answer the myriad questions I had; from specific questions about their job to questions about how they ended up on the Rainier. 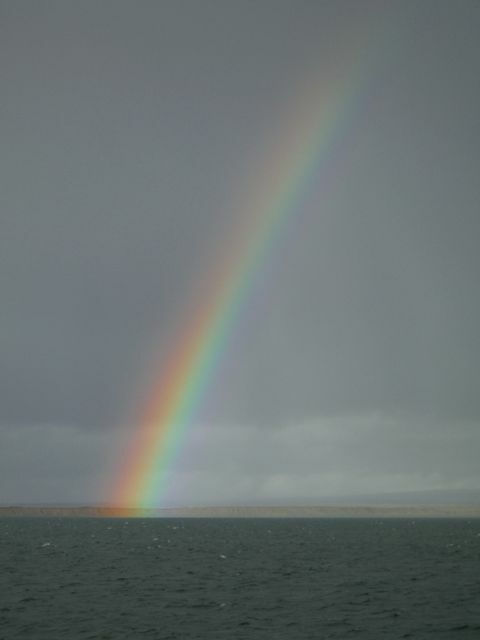 Perhaps we should have used some of our sonar capabilities to search for the pot of gold at the end of this rainbow! At the end of my Teacher at Sea experience I have to conclude that NOAA is one of our country’s best kept secrets. What other federal agency can bring you such treats as the daily weather report or tide predictions for an entire year, monitor fisheries along our coastal areas, keep track of our changing climate, or survey marine mammals? Of course, you shouldn’t forget all those nautical charts produced by the hydrographers on the Rainier. NOAA’s webpage says it all (http://www.noaa.gov/); from the ocean floor to the top of our atmosphere—and everything in-between. In a world with a rapidly changing climate I can’t think of an agency that is doing more important work. Many thanks to NOAA and the Teacher at Sea program for providing me with this incredible learning experience. 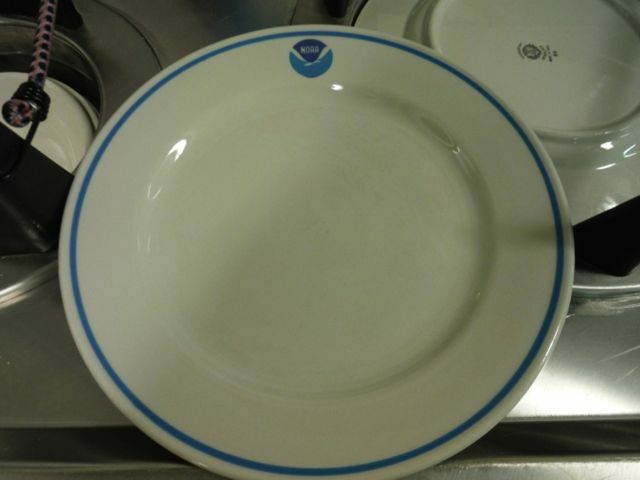 Even the plates have the NOAA logo! !